Just as other nations such as the United States and Russia have used space exploration as a national driver of technological progress, Ireland must use its unrivalled access to another virtually unexplored frontier – the ocean – as the catalyst for establishing its unique contribution to the future of human economic and scientific progress. The LaRouche Irish Science Team presents the following outline for a United Ireland free from bailouts, austerity and the corpse of the British Empire’s financial system. The British Financial Empire has been the dominant political force on the planet since the founding of the East India Company, maintaining their ascendancy through imperial wars, political manipulation and what ever despicable means they found necessary. Now, even for those who have been willing to acquiesce with this unspeakable evil for their own selfish gains, it should be abundantly clear that the policies of the financial oligarchy, such as globalisation, have failed catastrophically. In the wake of this failure, the economy of Ireland, like other nations of the Trans Atlantic region, lies in ruin, totally bankrupt, and the only way we can salvage it is by our commitment to a strategic, long-term, science driven development of the physical economy. We must look to advance technologically on every front and to increase the energy flux density of our economic activity as a whole. This will require the use of nuclear power generation and a move to advanced energy carriers and storage mediums like hydrogen, as the IAE have prescribed in their visionary paper looking towards a productive and prosperous Ireland in 2050, and beyond. Such a strategy also involves maximising the potential of our key assets, and the most prominent of these are our very significant marine resources. 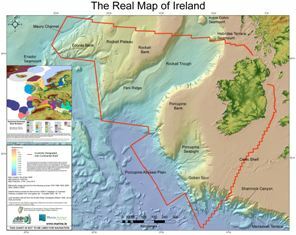 When you look at a map of the real Ireland, which includes not only the territory of the island, but also the full extent of the underwater continental shelf, it turns out that Ireland is the third largest country in the European Union, in terms of total area of the globe within its sovereign control. This extended Ireland comprises a marine resource of some 220 million acres, or ten times the area of our land surface. The coming realignment in world politics and economics presents an ideal opportunity to revive this proud tradition of trading and sea faring, and to make it a key economic driver to deliver future prosperity. Presently, it is estimated that 90% of goods produced are transported by sea. Research undertaken in 2006/7 indicates that 7.4 billion tons of goods were loaded at the world’s ports and hauled by around 16 000 cargo ships to their markets. With a return to a productive world economy, driven by developments around the Arctic in particular but elsewhere also, the volume of traded goods is set to increase dramatically, and consequently so will the volume of sea cargo. The opening of the NSR, underpinned by the economic development of Siberia and strategic political planning in Russia, will change the current pattern of world trade significantly. The Southern Sea Route, through the Straits of Malacca and the Suez Canal, or round the Cape of Good Hope for larger vessels, will inevitably become a less attractive proposition for cargo between Europe and Asia. The unavoidable choke point nature of the Suez Canal as well as its associated fees, the restrictions on ship size imposed by the Malacca Straits and the Suez Canal and the comparative distances, all augur well for the NSR, not to mention the piracy threat on the southern route. An additional factor which will also have major implications for international shipping is the inexorable trend towards ever larger container ships, the latest generation of which are able to carry up to 20 000 TEU (20 ft equivalent units) at a time. With the costs of sea freight escalating in line with other transport costs, shipping lines recognise the need for the improved economies of scale offered by larger vessels, both in terms of greater cargo capacity and their newly designed, more fuel efficient engines. AP Moller Maersk, the Danish world leader in container shipping, has committed to spending $1.9 billion on a fleet of ten such ships, with the view that they will be cheaper to send across the oceans than a larger fleet of smaller vessels. The new ships will be able to transport 16% more cargo than their current flagship, the Emma Maersk, the world’s biggest, and will stand 73 meters tall, 400 meters long and 60 meters wide. At present, only two ports in the world, Rotterdam and Shanghai, have adequate infrastructure and sufficiently deep water to facilitate these huge vessels that require 20+ metres of water for transit and docking, and geological restrictions will prevent most of the world’s major, established ports from being able to deepen their access channels and docking facilities adequately to accommodate these giants. 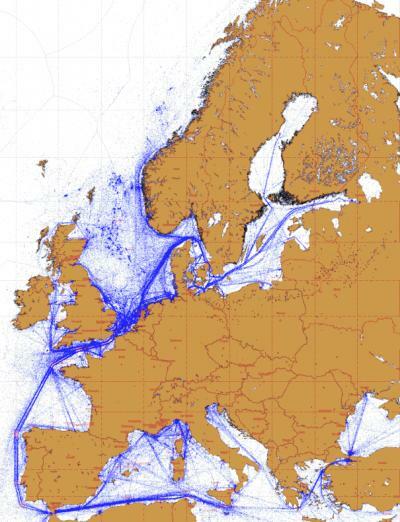 With European shipping routes and their associated ports suffering from increasingly heavy congestion, particularly around the English Channel (where shallow water is also a major problem), as illustrated in the map above, a deep draught, super-port at the Shannon Estuary will provide a compelling option for NSR and Trans-Atlantic ships. As the afore mentioned IAE paper confirms, the Shannon Estuary had long been identified as an ideal location for the construction of a high capacity/deep draught container port. Its development and eventual connection – with a dedicated high-speed rail connection across Ireland, via the proposed ‘Tuskar’ Sub Sea Tunnel across the UK and via the Channel Tunnel to the Continental High Speed Rail Network – would allow double-stack container trains to distribute the trade onward to Europe. The development of the Shannon Estuary and rail link, together with its multiple ancillary support services, would provide a massive boost to the economy of the South West and South East of the country in particular and would also greatly enhance plans to develop a western economic corridor from Cork to Derry. At the northern end of this corridor, Lough Swilly in Co Donegal is another substantial deep water inlet with potential for development as a port facility, although this potential has yet to be fully explored. The development of the Shannon Estuary should be approached with the same bold view and nation building passion as was the building of the Shannon Scheme. This project, which aimed to electrify Ireland, inspired the then Governor of New York State, Franklin Delano Roosevelt, to enquire into the building of the scheme and to undertake the similar implementation of the Tennessee Valley Authority when he was elected President of the United States of America. But although plans were announced by the state-owned Shannon Foynes Port Company in 2004, for a 350 million euro investment to transform the River Shannon Estuary into one of Europe’s largest cargo hubs, the plans have barely moved beyond the public discussion stage. Although the investment is a welcome move, it should be seen as only the first step towards the development of an international deep water shipping resource which will rival Shanghai and Rotterdam as the biggest port complex in the world. 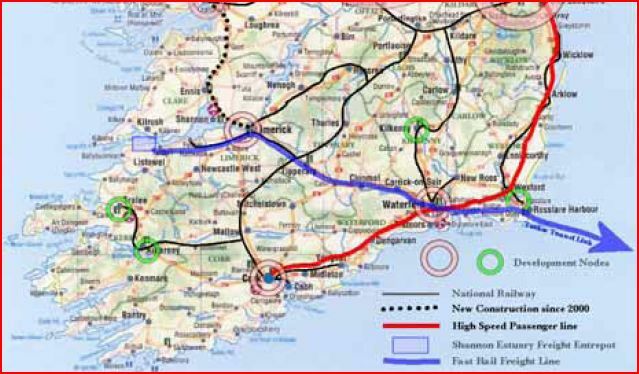 This new Shannon Super-Port, connected by high speed maglev rail to the Tuskar Tunnel between Wexford and Pembrokeshire, could facilitate the efficient delivery of freight right into the heart of Europe. The plan mandated by the provisions of the bailout package, to rationalize and sell off the Shannon Foynes Port Company, will no doubt be rejected by the Irish people, as it becomes clear what a crucial asset the Shannon Estuary is. The NSR is a navigable passage from the Pacific to the Atlantic along the Siberian coast. Parts of the route are believed to have been used by local traders as early as the 11th century, but Russian diplomat Demitry Gerasimov, in 1525, is thought to have been the first to conceive of the possibility of a continuous route from the Atlantic to the Pacific. In the early part of the 17th century, Isaac Massa, a Dutch grain trader, diplomat and explorer, further contributed to studying the possibilities of using the NSR for developing the eastern boundaries of Russia. Later, in 1648, Semyon Dezhnev and Fedot Popov proved the existence of a strait between Russia’s east coast and Alaska, now known as the Bering Strait. Many early expeditions along the route, also known as the North East Passage, foundered due to the perilous conditions and it was not until technological developments such as radio, steam ships and icebreakers that it became a viable proposition. Even then, though, various factors prevented it’s use for international commercial shipping, in particular World War 2 and the Cold War which followed turned the region into a strategic battleground dominated by submarine and surface naval vessels and off limits to international commercial vessels, although the Soviet commercial fleet did use it extensively, with freight transport increasing dramatically from 500 000 tons to over 6 000 000 tons during the period 1953 to 1987. When the route was eventually opened to non-Russian shipping, during the Perestroika era, the traffic generated was insufficient even to cover the cost of keeping it open. High charges for the necessary icebreaker assistance, the precarious nature of the trips and high insurance premiums were the reasons cited for the scant interest shown by the international shipping lines. At the same time, the Shock Therapy attack on the Russian economy saw domestic freight movements decline greatly from a peak of 6.5 million tons in 1987 to a mere 1.5 million tons in 1998. As has been documented by our friends at Turn180.ie, a general increase in temperature in the Arctic region has already produced a considerable melting of ice around the extremities of the Arctic Ocean. This welcome development currently permits navigation of the NSR for up to seven months of the year, according to Russian officials and access will be further enhanced by the expansion of the Russian icebreaker fleet with six new ships, three of which will be nuclear powered. Many predict that the melting trend will continue and may possibly intensify during the present century, to the point where the entire ocean will be navigable all year round with the aid of icebreakers. If this were to come about, the trip from the Atlantic to the Pacific would be even shorter as ships could sail directly over the North Pole. In all other respects the Arctic is climatically well suited to shipping with an almost constant area of high pressure over the North Pole giving predictable, generally settled, conditions with sudden weather changes uncommon. The danger of fog during the summer months is largely eliminated due to the enhanced satellite navigation technology now available. The melting of Arctic ice and the opening of the NSR which that has facilitated is very timely coming as it does during a period of massively increasing trade between Asia and Europe. However, there is another, even more compelling dynamic, which will establish the route as a major transport artery, that is the planned development of Siberia. A resurgence of Russian domestic freight traffic on the NSR in recent years has been driven by the discovery and extraction of oil and gas resources, mainly in North West Russia. These abundant natural resources, and particularly those as yet untapped in eastern Siberia, which Russia has committed itself to developing, will be the key driver in bringing the NSR to full prominence in the coming years and long into the future. The very scale of Siberia is difficult to fathom, particularly relative to a small country like Ireland. It stretches from the Ural Mountains in the west to the Pacific Ocean in the east and from the Arctic Ocean in the north to the borders of Kazakhstan, Mongolia and China in the south, encompassing 75% of the territory of Russia, some 5 million square miles. To put this in perspective, it is 1 ½ times the size of the USA (including Alaska) or 1/10 of the Earth’s land surface. It is a sparsely populated region containing just 36 million people, less than 1/3 of Russia’s population, and roughly equivalent to the State of California. Its vast forests, principally of Larch, constitute approximately 1/6 of the world’s total forest cover and its rich fishing waters produce over 10% of the world’s annual fish catch. Lake Baikal, near the Mongolian border is the world’s deepest and most voluminous freshwater lake with an average depth of 744 meters and containing 20% of the world’s unfrozen surface fresh water. Apart from oil and gas deposits, which are substantial, and the forestry and fishery resources that I have just mentioned and which are currently being utilized to some extent, the real physical wealth of Siberia lies in the rich accumulations of mineral resources that abound throughout the region. Although most areas remain largely unexplored, geologically, what deposits have been found represent some of the highest concentrations of industrially useful minerals anywhere on the planet. The 9000 mineral deposits thus far registered make up an estimated 16% of the world’s mineral resources. The table in the appendix refers to just a sample of these by way of illustration. Russia has declared its intention to base its economy on science driven, manufacturing production and technological development. Therefore, in contrast to the exploitative, imperialist, mining operations that have been common practice, in Africa and South America, for example, the primary use of Siberian mineral resources, once extracted, will be by newly established indigenous industries which will process them into higher value materials, both for use at home and for export. This said, given the scale of the resources available, there would undoubtedly be adequate surplus raw material available for export around the world. This very brief sketch will, we hope, provide some aid to visualizing the colossal potential of this, as yet, largely undeveloped region. 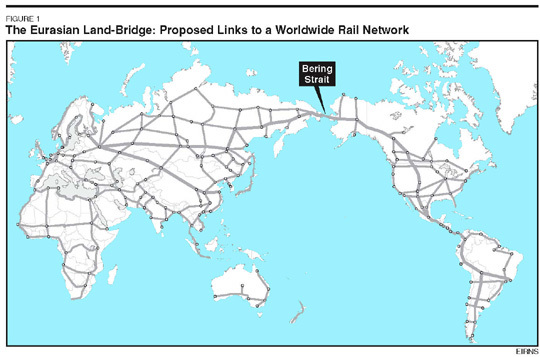 But with the Eurasian Land-Bridge now back on track, so to speak, a feature of this massive rail network will be a new 3000 miles long northern Trans Siberian track which will run along the Arctic coastline parallel to the existing Trans Siberian route. Like the other proposed main rail lines of the world land-bridge, this track will utilise leading edge, high speed, magnetic levitation technology employing trains running at 300 mph. The northern Trans Siberian line will not be a stand-alone project but will form the backbone of an extensive development corridor through the region, which will include multiple hydroelectric dams and numerous nuclear powered, major industrial cities. Therefore, together with similar developments planned for Alaska and northern Canada, this entire extended Arctic region will become the most technologically advanced region anywhere on the planet. The scientific and technological expertise required to make these plans a reality will be provided by the Siberian Branch of the Russian Academy of Science (RAS), which employs 31 000 technicians, scientists and engineers in a network of multi-disciplinary science centres throughout Siberia. The RAS has stated its commitment to broadening international cooperation at all levels from government down. With China and Russia now fully committed to a future based on cooperation and the scientific development of their physical economies, America stands just “one small step” away from joining them in an alliance which will change the world for the better, beyond anything most of us can imagine. Those famous words of Neil Armstrong which signalled such hope for mankind, have, if anything, an even greater significance in our present context, for once the small step is taken of replacing the now bankrupt monetary system with a credit system, based on the American model of Alexander Hamilton, then the final breakthrough will have been made, opening the way for those three leading nations to instigate an economic and cultural renaissance, the likes of which has never before existed in known human history. British puppet, Obama, remains the only obstacle to progress, his malicious intent on behalf of the financial empire matched only by his incompetence. However, following his safe removal from office, by constitutional means, the convergence of political will amongst these three nations, directed towards a physical economic orientation, will quickly attract other like-minded nations, including Ireland we hope, to adopt a similar approach and join in this new alliance. The credit system that will facilitate all these possibilities is based on a model designed by Hamilton following the American War of Independence. The fledgling nation was bankrupt from war debt and he realised that its independence would be short lived if measures were not taken to alleviate this problem. His strategy was to institute a national bank through which credit could be issued for large scale production and development projects thereby wresting control of the nation’s finances away from the international financiers and delivering it to the government on behalf of the people. Hamilton’s credit system was recognised as vital for maintaining national sovereignty and as such became a tenet of the US Constitution. Based on this system, America rapidly became, and remained, an economic powerhouse, faltering only when it deviated from this policy, as in the recent decades from around 1970. Now, the US stands poised to return to its founding principles of American System Economics, with the re-instatement of the Glass Steagall Act. Ireland must seize the opportunity to follow its lead and establish our own credit system economics that will allow us to develop the large scale projects outlined here and to build the nation, free from the control of our present financial overlords. To initiate the necessary, immediate economic recovery, Ireland must first write off the toxic, so called “assets” of the banking sector and then look to projects such as outlined in this document – high-technology, capital intensive projects of sufficient scale to provide full employment for the population in real, productive jobs. To facilitate this, a credit system must be introduced whereby the sovereign government issues money as credit, directly to the identified projects and also through the reconstituted banks, to rebuild other productive businesses, as an investment in future generations – in the future of the nation. It is our hope that, in short order, the wise words of Lyndon LaRouche will be followed, and once Obama is safely ushered out of office, HR 1489 will be passed in the US Congress bringing about the reinstitution of Franklin Delano Roosevelt’s Glass-Steagall law. With that accomplished and the US returning to a Hamiltonian credit system as opposed to the presently bankrupt monetarist system, the nations of Europe will be freed from the British imperial financial system to follow suit. The US, Russia and China, three nations that have fought the British Empire determinedly and emerged victorious as sovereign republics, are now on the verge of forming an alliance based on economic cooperation and development, the very scale of which will transform the world and render the empire a historical curiosity. This new alliance is the long awaited, natural home of an Ireland reunited with its republican principles and traditions, and we can assure you it will be welcomed into the fold with open arms and with celebration. And our economic endeavours, such as we have outlined, as a reflection of our new orientation, will become a vital part of this new alignment and will be appreciated as such. After all, who do you think the governments of Russia, China and the US would prefer to do business with – the representative of a repugnant, and now defunct, financial oligarchy or the president of sovereign Irish Republic, founded on the same principles and with the same political and economic outlook as their own nations? The development of Siberia and the NSR, which we have briefly outlined, will be only the beginning of an economic revival which will propagate throughout the globe to include Central Asia, South America and Africa. Extensive plans have been ready for implementation in these regions for decades now, all that was missing was the political will to act on them. Now as we look to put the era of imperialism behind us once and for all, and move towards a world of truly sovereign nation states, economic activity is set to flourish as never before. Russia and China are leading the way and the US, we are confident, will join them soon. Ireland should embrace this emerging new political and economic reality at the earliest opportunity and the development of an international deep-water trans-shipment port coupled with a massive expansion of our deep-ocean scientific and engineering capabilities would put us firmly on the right path. In addition, the region leads the world in terms of Potash and Diamond deposits, is second in terms of Phosphorites and third in terms of Gold. Table of mineral deposits discovered to date in Siberia. Hi. I have been working with LaRouche since 1968. I have a cousin you may know, Sir Roger Casement. Recently Wikipedia removed the discussion of the Black Daries. Casement was not hung because of Ireland. He was hung because of what he did to King Leopold. I think the best thing people can do right now is to join the LPAC mobilization to gather support for Walter Jones’ impeachment resolution, as a matter of urgency. LPAC teams have been on the ground across the country since the resolution was announced and will continue to organize vigorously in the days and weeks ahead. I would urge all who are interested in the success of this resolution to join them in the fight. Organize effectively – use this leaflet http://larouchepac.com/node/21925 and demand that your congressman supports the resolution.